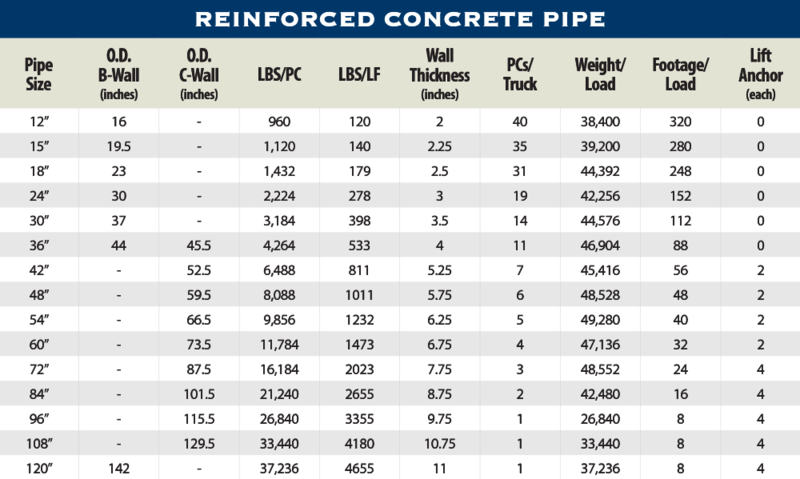 American Concrete Products manufactures a complete line of standard and specially designed reinforced concrete pipe for storm water and sanitary applications. We offer two styles of watertight joints; single off-set and confined o-ring gasketed joints, to meet all the design challenges of underground sewer applications. Contact an American Concrete Products – Utility Division representative for details not listed on this page. All RCP sections are 8 ft lengths. RCP is available in Class III, IV, V and special design. RCP less than 42” has no lift holes. 42” RCP & larger has Dayton Superior P-75 utility anchors. RCP is produced to accept Tylox SupersealTM pre-lubed rubber gaskets or confined oring rubber gaskets.